SoftOrbits Photo Background Remover is a photo correction utility that allows to remove background your photos, cut and paste objects with ease. The program features automatic background detection with batch processing, smart object selection and smooth edges to ensure the object blends with its new background seamlessly. Fully automatic background removal is great, but what if that picture has more than object to keep? You can guide Photo Background Remover to tell what’s what. Simply mark objects you’re keeping with a green marker, or mark areas to remove with a red one, and Photo Background Remover will apply its smart selection techniques to remove just the unwanted parts of the image. Photo Background Remover can protect your work with an optional watermark. With watermarking enabled, you can place a custom image or text over your images with adjustable opacity. 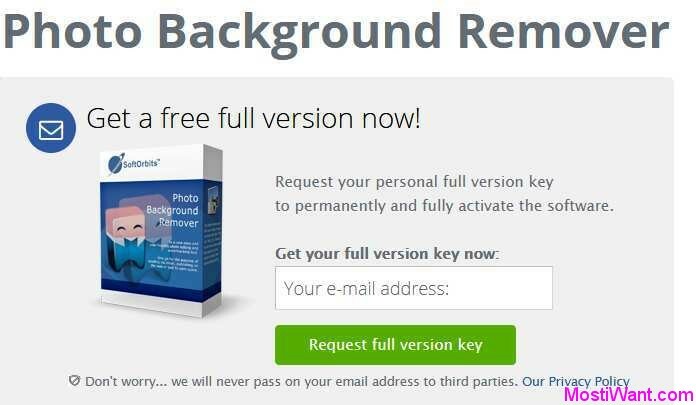 SoftOrbits Photo Background Remover normally charges $49.99 per license key. But as part of the giveaway offer, you can download Photo Background Remover 4.1 latest full version for free. To grab your free copy visit the registration page here, enter your e-mail address and press the “Request full version key” button. Download SoftOrbits Photo Background Remover: BackgroundRemover-Setup.exe [9.4 MB]. Install and active full version with received license key. Giveaway of the day are having a giveaway of Photo Background Remover 4.1, where everyone can download a full version copy for free. The giveaway will be valid for today only (24 hours on October 8, 2018). Don’t miss it. Great promisses, but in the end it’s not better then the other tools that use this ‘geen marker – red marker’ approach. I tested eight different photos, from blurrish disorted backgrounds to simple plane, but the results been very poor. Sometimes large sections the background were still there, sometimes it erased sections of the object i wanted to stay in the picture. the edges were scraggy and way to blurry. Lucky me, I tried it as free giveaway. I can’t belive someone charge 50$ for this, when there’s open source and free software like G**P out there, that get’s the job done right in a way more professional manner.